You Are Now A Mushroom. What will you do? You are so tired of being a mushroom. Goodbye cruel mushroom world. such is the tradition of the mushroom people. You spy a tiny 'shroom among the brush. Smaller than you, even! You are kinda disappointed you can't live up to your nickname, The Littlest 'Shroom. You catch the attention of the shy creature. What will you call your new friend? ==> Name the tiny shroom "Spanelly"
Name the tiny shroom "Spanelly"
Snowflake informs you in an aggressively polite manner that it is rude to waltz around naming creatures who have names already. She just won't have it. She decides to tag along to make sure you learn proper etiquette. Huh. These stats aren't that bad. Weak strength, as expected. But still decent considering. You are in MUSHROOM MEADOW. Your map is mostly blank. You start your long trek west, which is the direction you are facing, and walk forward. Your journey of a thousand miles starts with a single step. That is as far as your feet take you, as you stop and ponder what that is over there to the corner of your eye. 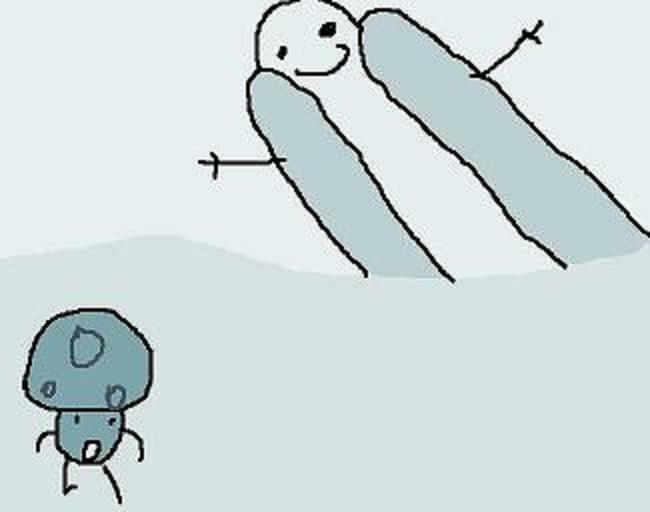 You use your trusty MUSHROOM CURSOR to move the object into clear view. Oh! It's your Chat Window! You were wondering where you put that. It appears your sidekick has been yapping this whole time. You can use your Chat Window to have conversations with other characters. Or, you would, if you had the matching Chat Input Interface. Without that, you can't even block this mouthy pipsqueak. Those things are just so hard to keep track of, you know? An ordinary, teeny tiny Hint Cricket. Ugh, why does this game keep throwing random crap like this at you? And by "this game" you mean your duel with the adversary known as altitude in the struggle for the title of the littlest shroom. It's just going to keep spitting out useless information. Better shut it up quick. Wait a minute, now's your chance! He doesn't have a name! You like giving names to things and people, especially to those who are shorter than you. It gives you a sense of superiority. First you decide to shut up this mouthy pipsqueak. Hint Cricket Gavin. What where you expecting? You do not have a rock equipped! put Hint Cricket Gavin in your pocket to take with u, while u look for a rock to hit him with. haha!